Level 42 took the '80s by storm with their brand of bass driven jazz funk that came from the underground soul scene of wedge hair cuts, pegged trousers, sharp shoes and soul patrols. They led a band of UK ‘funksters’ and soul acts that for a time changed the face of the street scene in Britain. 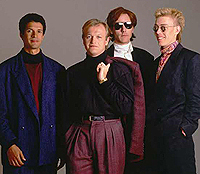 Level 42 clearly became the most influential of all the British acts but the likes of Incognito, Light of the World, Linx, and Beggar and Co. to name just four, made their indelible mark and gave the scene an identity - which allowed mainstream radio to embrace more easily the infectious bass lines that were the hallmark of Mark King and Level 42 for a decade and beyond. The revolution started in the Isle of Wight when Mark King, Phil and Roland Gould, and the all important keyboard electricity of Mike Lindup joined forces and were soon spotted by inde label Elite then subsequently by label giants Polydor. Their success in record and ticket sales, chart positions and awards is only half the story. The band left a legacy amongst a generation of 70s teenagers who had been bought up on US funk and disco that their was life on the UK scene with home grown acts. Their music has been regularly remixed and they continue to have their bass lines and keyboard melodies interpreted by present day acts. I recently had the opportunity to speak with Mark King, lead singer and bassist of the band, about the bands early origins, about the theft once of his drum kit, about touring the US today, and, of course ... penguins! 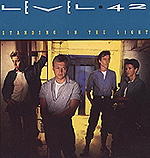 Taking it from the top, and Level 42 were labeled as a pop rock jazz-funk band ... to your mind, is that still a fair description of the band and their musical styling's, or have you always thought differently? "I like to think of the band as unique, but I guess I would wouldn't I? So, pop rock jazz-funk, with a bit of folk and country thrown in, particularly with the up-coming acoustic stuff, will do nicely." And, for the record, just where did the bands name, Level 42 originate from - and, back when you were naming the band, what other name choices were being discussed? "88 was the first name we all agreed on, but it turned out that there was already a band called 'Rocket 88' that had been around for a while so we kept looking. The 'number' thing seemed to work well because we were coming in on the tail end of the Punk movement and the previous four years had seen bands with very aggressive names that aligned themselves to it so we were looking for something that might suggest another style, and a book that Boon and I were reading at the time, 'The HitchHikers Guide To The Galaxy', had the number 42 as 'the meaning of life and everything' - perfect!" The band has always been renowned for your slap-bass guitar technique along with the combination of your lead vocals together with Mike Lindup's falsetto backing vocals. But isn't it true that you began your musical career as a drummer, but that due to an ill-fated European venture, you had to sell your drum kit in order to fund your journey back to the UK?! So, exactly what happened on this European Vacation? "Thank you. Yes I did start out to try and make it as a drummer. I had left the Isle of Wight where I was raised at the age of 18 to move to London and seek fame and fortune as ' the next Billy Cobham', and was working in a music shop on Charing Cross Road, Macari's, when Bill Liesgang who also worked there asked if I wanted to come to Austria with him and join a band." "We spent a harrowing couple of days crossing Europe in a van with all our possessions in tow and arrived in Vienna to spend the next three months starving. With only one show under our belt it was looking increasingly like this wasn't to be the gateway to success that we had hoped and the guys who ran the band said they'd help me out with getting back to London, and send my stuff back later, my 'stuff' being my drums, record collection, and clothes. Ah, the innocence of youth! Of course the 'stuff' never showed up and some months later I headed back out to Vienna to claim what was mine - a sort of jazz-funk High Plains Drifter if you will, and a good job too as my drums were sitting in a music shop window priced to go. I got them back, but never saw my records or clothes again." And, with regard your thumb-slap bass guitar technique, word has it you were working in a London music store, where you observed visiting American funk players demonstrating just that! Can you remember who these funk players were - and was it hard to teach yourself not only this technique, but the bass guitar in general? "Well, slap was a style of bass playing that appealed to me enormously because it was like drumming on another instrument, very percussive and irresistible if you like to dance, and every so often a dude would come into the store and slap away. If Macari's had sold drums I probably wouldn't have been that interested but they didn't, and I had itchy fingers and wanted to play something! So I'd grab a bass when the store was quiet and let fly. Having heard guys like Stanley Clarke and Doug Rauch playing like this on record was a real inspiration, though sadly they never came into the store while I was there." The band's debut self-titled album (1981) was an instant hit, containing the first single, 'Love Games' - and then came The Pursuits of Accidents (1982) with the single 'Chinese Way,' but it was on your fourth album, Standing In The Light (1983) that the single 'The Sun Goes Down (Living It Up) ' really made the UK charts stand up and take notice. Around that time were you aware of the growing fame, the ever-increasing popularity of the band, and if so, were precautions being taken by the band not to let it spiral out of control? "We had been plying our trade up and down the motorways since 1980, carrying our gear in the back of the van, sharing driving duties and lugging equipment between us, and though as you say we had enjoyed chart success with both albums and singles we were still setting up and breaking down our own equipment, and by 1983 and having had the latest album ' Standing i the Light' produced by Larry Dunne and Verdine White from Earth Wind & Fire, we were still doing it!, so I guess success rushing to our heads wasn't really an option because we were working too hard to notice." After True Colours (1984) had given us both 'The Chant Has Just Begun' and 'Hot Water,' the release of 'World Machine' (1985) truly gave you worldwide fame! Inclusive of the smart pop songs such as 'Something About You' and 'Leaving Me Now,' it seemed that your sound had moved on from original pure jazz-funk once and for all. Especially as Running In The Family (1987) contained more massive international pop songs - such as 'Lessons In Love,' 'To Be With You Again,' 'It's Over,' and the title track, of course! Was there ever a time back then, even when the pop hits were piling up, that you thought you had musically sold out - or that leaving the jazz-funk core behind was simply chart/career evolution for the band? "Aha! The old selling out thing ... well, the music was evolving and following it's own course, led no doubt by the increasing success that each release was achieving, and though there was never a conscious decision to steer away from the early material we did realise that to garner another contract from the record label we would need to reach a wider audience. I suppose the seeds for our development as songwriters were sown by Andy Sojka, our first producer and label owner, way back in 1980 when having heard five or six instrumentals that were little more than 'jam's' advised us to " look for a singer and come up with some lyrics for that smooth riff you played earlier and I'll record it for you". That riff became 'Love Meeting Love'." The original line-up split in 1987, at the height of some pretty incredible chart successes. As the press relates to it today, it was down to both exhaustion and internal working differences. In reflection, could that split have been avoided re: Phil and Boon Gould, or had it been brewing for a while? "Hindsight is a wonderful thing and there are inevitably things that anyone might do differently given another chance, but the reality is that you either roll over or get up and get on with making music. Of course it seemed like hard work, but compared to spending all day digging a trench, or trying to educate a room full of students, or caring for patients in a hospital somewhere it was a walk in the park, but we'd had a good run with that line-up and it was time for change, to quote your President, and we welcomed two fantastic players into the band in Gary Husband and Alan Murphy." To this day, one of my favorite CDs to listen to whilst driving is Level Best (1990) - which actually came about due to the year you took off after the untimely death of Alan Murphy. It's said that to fulfill the band's contract to Polydor Records, you had to come up with something and that suggesting the songs and arrangements for Level Best was the easiest thing to offer them at that time. 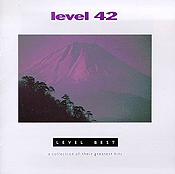 Funny how things turn out as that album is renowned all these years later as - although it's obviously a hits compilation - the perfect collection of Level 42 songs to have in one place at one time! "Thank you, yes I agree that some compilations can be a really good way to have all your favourite tunes to hand, and an interesting precis of a bands' development. Losing Al was a huge blow to us, you know, just when it seemed we were about to take the band to the next stage we lost him, and he was such good fun to be around. We had a fantastic week in New Orleans in 1988 making a couple of promo videos for 'Heaven in My Hands' and 'Take a Look' - memorably hilarious times!" 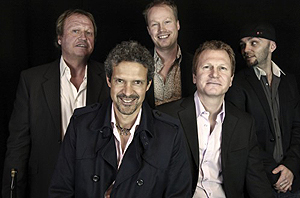 Subsequent albums followed, including a move closer to Level 42's R&B/jazz roots on 1994's Forever Now, but then the news came down the pipe (1996) that Level 42 was disbanding permanently. Announced on the day of a gig at the Manchester Apollo, reflecting back to that day, did you truly believe that was the end - or, in the back of your mind, were you still not convinced the band could/would ever seriously call it quits? "Ah yes, my predictions. If I ever offer to read your palm, Russell, walk the other way. The thing was I really needed a break from it all, and during the 1994 'Forever Now' tour decided, along with Mike, to put the band 'on ice', which is what we did. With no set plans to re-group one year led to another and by 1998 I had recorded another solo album 'One Man' and was back on the road as 'The Mark King Group', then 'Marky Mark King's Trash', then 'Gruppo Mark King', a true Libran can never decide!, but I love playing live and enjoy being with the guys on the road, and I realised just how much I had missed doing it, so it was time to get Level 42 up and running again." 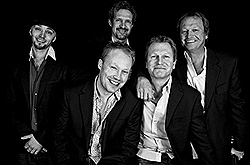 And today, we hear that the (thankfully) reformed Level 42 might well be bringing out a new studio album here in 2010? Well, being that we're not called Exclusive Magazine for nothing, can you give us the working title to this upcoming new album, ... please?! "Well, firstly I can't tell you how excited we all are to be coming out to the US again after so long. I know we have some very loyal supporters over here and we'll have a blast in July. Then, to mark our 30th Anniversary, Universal Music are putting together a boxed set of 4 cd's, the first two cd's being the entire singles release, A sides and B sides from 1980's 'Love Meeting Love' to 'Just For You' from our last studio album 'Retroglide' (2006), cd 3 being crammed with rarities for the die-hard's, and cd 4 will be a cd of acoustic versions of 10 of our songs from over the years." "This particular project has been very rewarding to undertake as the new versions take on a whole new dimension, and far from being limited by keeping them in the acoustic domain, they have been re-invigorated and are sounding really fresh." Indeed, what is the current status of Level 42 today? Band member wise, tour wise, temperament wise? Now you are all older and wiser, I'm assuming the past is the past and it's all happy families, yes? "Current line-up is Mike Lindup, keyboards and vocals, Nathan King, my brother, on Guitar and Vocals, Sean Freeman on sax and vocals, Pete Ray-Biggin on drums, and myself, Mark King, on Bass and vocals, and it's a family thing Russell, so we love hanging out together, and then love it even more when we say "goodbye", ha! The Level 42 website is the best place to catch up on what's what with the band though, and there are some pretty good links to follow too!" 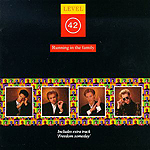 OK, here's a fun one, looking at the cover artwork for these three (3) albums, please describe what was going through your minds at that time - 'Level 42,' 'Standing In The Light, and 'Running In The Family'! 'Level 42' - "New band, need an image, they love science fiction, how about something that could be from a Frank Herbert novel?" 'Standing in the Light' - "Get a stylist in, and a good photographer, make the lads appeal more to the post new-romantic crowd. Can we keep the clothes after the shoot please?" 'Running in the Family' - "Um......... cheer up lads, it's only music!" Will the original Level 42 line-up ever perform over here in the US on one of these ongoing '80s revival tours? Something like the Rewind tour, the Regeneration tour, the Here & Now tour, etc? I mean, we're here for you if there's anything we can do do aid this for you? "Well you never know what's down the line do you? but for now I'm very happy chugging along as we are, I'll bear your kind offer of support in mind though." Fun Five - OK, it's now time to fire off some quick questions - to allow those that think they know Level 42 to perhaps think again! a) Can you remember your very first TOTP appearance? What song/year was it and at what level of nervousness were you at that whole day? "Yes, of course! TOTP was the 'holy grail' for bands trying to make it into the charts, and we made it in 1981 with 'Love Games', our 3rd single. I remember calling up my parents and telling them, they were sooo excited!" b) Is there one of your songs that you look back on and would today change the title to, or a line/lyric from it - and if so, which one, and why?! "No, the songs are a like a time capsule of the moment we wrote and recorded them and for better or worse that's how they remain." c) Do you have a recurring nightmare or dream - and if so, how does it usually end? "I haven't had a recurring dream for so many years now, and it's even hard trying to remember the ones from my youth, but I've never been unduly disturbed by dreams. I buy into the idea that the homo-sapien brain tries to organise random images during sleep into some logical stream of events to make sense of it all." d) What is your sweetest, guiltiest pleasure (food wise!) late at night? "I don't really have a sweet tooth either, more a savoury kind of guy, and my wife makes the best pizza!" e) If you could meet any deceased celebrity, who would it be - and what would be the first question you would ask them? "Jack Ruby, and I'd ask " so what really happened then?" But we are all supposed to meet again 'on the other side' aren't we? So it's just a matter of time!" What's your connection to Robin Scott's pop project M, and their/his HUGE hit, 'Pop Muzik'? Did you play on the single and/or subsequent album, perhaps? "I had nothing to do with M's 'Pop Music,' but did play on Robin Scott's second album 'The Official Secrets Act' which was great fun to do, and all for charity too! 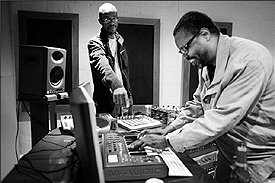 Making friends with Wally Badarou was the real bonus of these sessions for me though."